H is a collector! He is a collector of facts, like the Amazing Craig (H’s Dad) and like myself! And also like me… he is a collector of stuff! We both love thrift stores and the thrill of a treasure hunt! As lovely as it is that he is surrounded by his nest of favourites… it is difficult for him to keep it all organized – which makes it even more difficult to clean! I interpreted this as his being on board with my latest scheme! I should share that I sometimes envision H being on the show Hoarders someday if we don’t adjust the trajectory a bit here! Yes – that is a bit melodramatic – I know! – but it is part of the context. It is a part of my reaction – and I need to be aware that sometimes I extrapolate a present situation to a future in a way that is not particularly realistic, or even helpful to anyone. I want my child to have the skills to interact with the world. Sometimes I am afraid he will build a protective nest around himself and the result might be that it enables him to engage in his interests in a way that keeps others away. However, this is my fear to own – and it exists only in fleeting moments. I realized I had to assist H again into breaking down the job into manageable chunks and give him the message that we were there to assist and support him in the undertaking. I had to set aside my unreasonableness and take it out of the mix, so that it would not add anxiety to the situation. 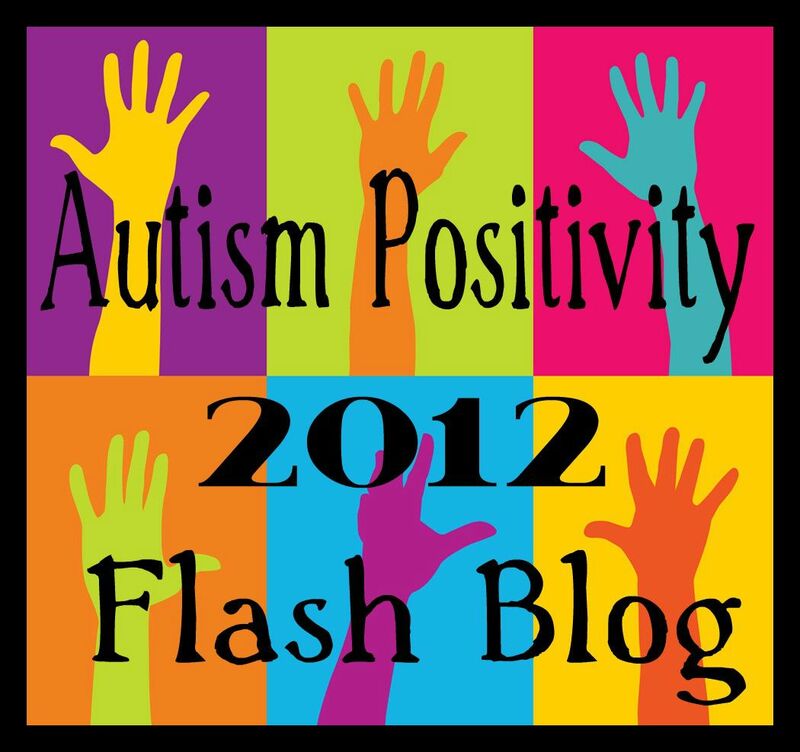 I supported H in picking out sections to focus upon… and helped him sort and organize. I will continue to do this and shift my way of thinking about his room to be more supportive to his developmental needs. I will continue to remind myself that this is an opportunity for skill development, apparently for both of us! H won’t keep it clean at this point – so we need to support him in scheduling clean-up time so that his room doesn’t get so far away from him and become such an overwhelming task. He needs to be able to visualize a shift his daily strategy so that he can see that putting something away – may make life easier in the long run. He needs to be provided with opportunities to develop ownership and pride for his organizational skills. Today there was a lot of learning that took place – but I must admit – it was mostly my own. I had a chance to think about the framing of the task and separate it from my own fears and judgements. I said things like, “Your mission, should you choose to accept it: is to round up all of the Bionicle and Hero Factory guys and their replacement parts and to return them safely to their home base! Please destroy this message so it is not intercepted by any villains! !” H bought into that… I also used the term backwards playing… (Yes… I know – a stroke of genius!) This is how I framed some of the clean-up: sorting Lego is playing with it backwards and breaking the time/space continuum! And too… we took lots of breaks. Later – he yelled for my assistance. There was a pile of rubble on his bed. “Yes…” H replied with the relief of someone who felt understood. We dug in together… and we will continue to do so. 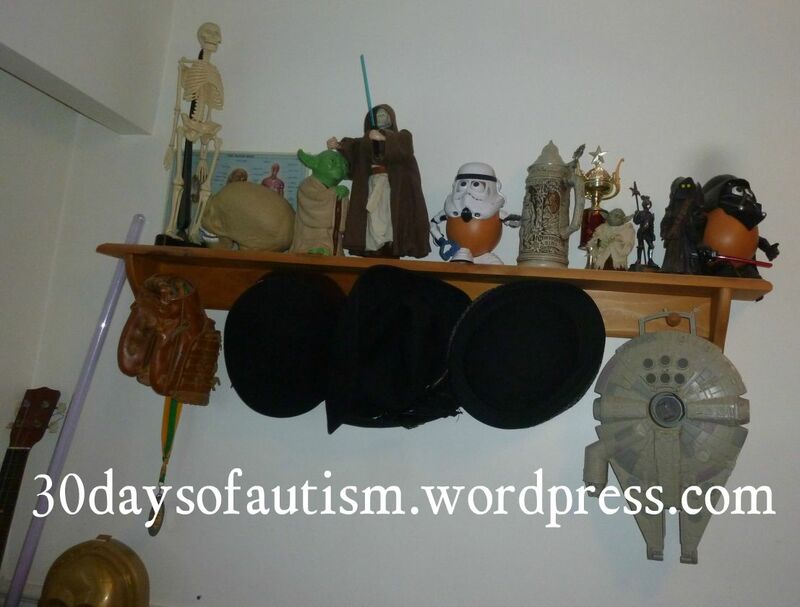 H’s room is a metaphor, a microcosm of our other places, struggles, challenges and successes! We are on this path together, and with generous guidance from Craig and my wonderful boy… we will all continue to grow and learn. 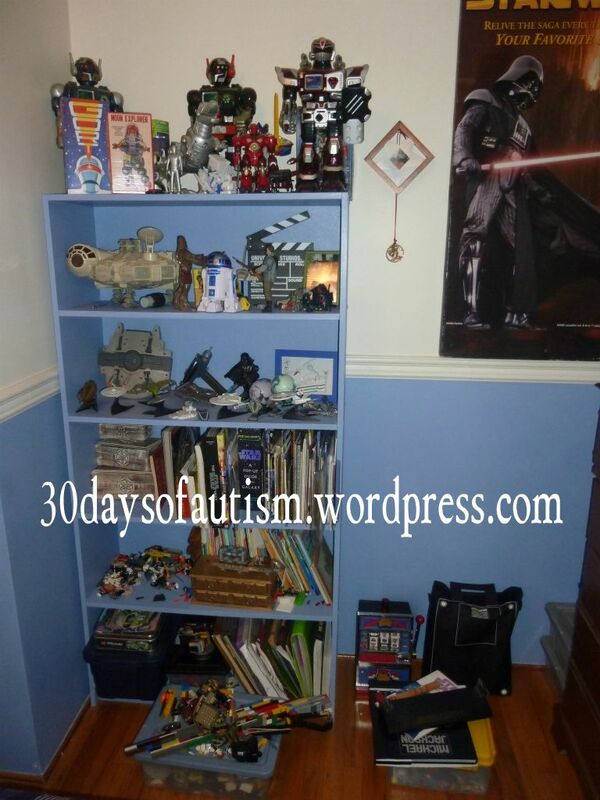 This entry was posted in Anxiety, Aspergers, Autism, executive function, HFASD, Indiana Jones, Journey, Michael Jackson, Parent, Star Trek, Star Wars and tagged bedroom, Cleaning the bedroom, development, Hoarders, organization, parent, parents, sensory overload, Star Wars, strategies, stress. Bookmark the permalink. 17 Responses to Cleaning H’s Room: Aaack! Will we ever move on from this? Did you say “backwards playing”? That’s the best thing ever! Next time we will be playing backwards.. Yes I did say “backwards playing”… and thanks 🙂 It keeps me on my toes to stay a couple of steps ahead of my boy… I’m not always able, but I love a good challenge. And when I can phrase things in a way that draws him in, the difference is remarkable. Please come back and let us know how the “backwards playing” goes. Yay! I had a very hard time cleaning my room and accumulating “stuff” – one of the things I had the biggest issue with is that the “stuff” all had very specific meaning – it feels like if I get rid of it, I get rid of a piece of my life. I don’t know how it is for H, but just wanted to add that bit of perspective. I’m really glad you and H found a way to clean his room OK. I didn’t develop those skills for ages. One thing that helped me, actually, was books on tape and making micro-goals. For example, if I were to clean my room, I’d spend the first 30 minutes of the day making a list of all the parts of my room that needed to be cleaned (bed, desk, dresser, bedside table, closet, floor), then micro-listing them (individual drawers, shelves, laundry, etc.). Then I would put them in order. When it is that way, it’s not nearly so confusing and terrifying. Then I’d put on a book on tape that I really like, and start doing the tasks. For me, cleaning my room was such a daunting task – there’s so much stuff in it, I don’t know where to start. By taking the time at the beginning to plan everything out, and also having something I was familiar with and loved (always a book I’d read multiple times, so I wouldn’t get super distracted), was definitely something that helped me considerably. Plus, it gave me a great sense of accomplishment to cross off each of the items on the list. Yes! I get that – I think both H and I have huge sentimental/meaning attachment to stuff. Admittedly, it might be that I am the one to be more attached to particular items and the meanings/memories associated with them than he is. Also, H loves story… You have inspired me! I am going to look into some audio books for room cleaning! Thank you E for your comment, insight, and suggestion! OMG – I can relate!!! Really interesting reading. I’m very much a hoarder ad therefore have hoarded a lot of J’s stuff in his room to a point you can’t see the floor. We will need to follow the above advice… Thanks. What an inspiring blog. And it goes to show how we all need to be open in our approach to challenges. Sometimes it’s hard for us as parents not to automatically apply our way of doing things. I love that you’re able to intervene when life becomes overwhelming – an area that I’m always trying to improve on. I have used some similar strategies (directing and chunking) with great success. Amazing what our little darlings can teach us, huh! Great post! 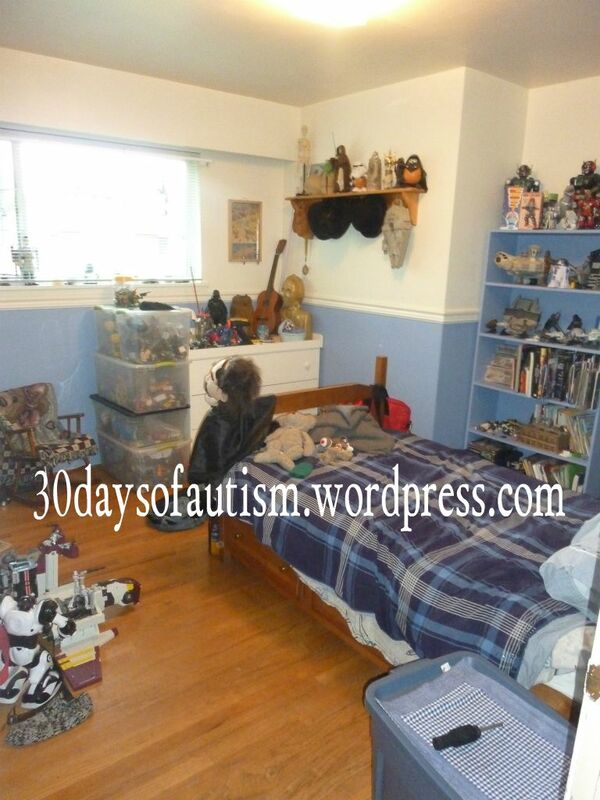 His room looks pretty amazingly clean to me. What did it look like before? Um… ya… it was difficult to walk… Definitely much better! It is so frustrating to be overwhelmed by things that seem easy to the rest of the world. I wish I can say that it is better at 38 years old, than it was at 14 but unfortunately it isn’t. My Aspie son’s room is an absolute wreck, and I can’t help him. I stand there and look around with the same amount of overwhelming paralysis. Everything calls out to me at one time, it all needs to be done, it all wants my attention NOW! Many times we winds up in a sea of tears and frustration. His at my being too demanding, and mine at the guilt I feel for not being able to help him more. It’s great you are there to support him, it will make all the difference. Support was something I never had. One other thing that comes to mind is my inability to prioritize the importance of tasks, or things in general. I have incredible difficulty determining which items are of greater importance to keep, or which task to tackle first.